In June I received my issue of Taste Magazine. I have subscribed for 11 years and was debating whether or not to cancel my subscription as I only really read the magazine for my friend Sam Woulidge’s column. However, when I found the recipe for Labneh on page 54 I decided I would renew my subscription as finally I had a recipe to try! Well, the recipe for labneh proved to be easy, but renewing my subscription was not! I clicked on the link to renew my subscription by paying with a credit card and it was not until my statement had arrived and the next issue of the magazine had not arrived did I see that the charge had not gone off my card. For some reason, the charge was declined – and this had nothing to do with there not being enough credit available. I tried again to make the payment with my credit card – and I used all four to no avail, each one being declined. It seems as if RNA had some issue and so I gave up. But, I did not give in! I decided to call on the lovely team at Taste Magazine to see if they could help me. They did not know how to resolve the issue with regard to credit card payments, but they made sure I would receive the next 11 issues of the magazine by gifting them to me. I have just collected the 100th issue – well done Taste team on such a fantastic achievement, and such a wonderful gift. So easy to buy good labneh here – love that you made your own though. That’s what a loyal customer like you deserves 🙂 Great customer service plus a great recipe! Happy Sunday, Tandy!!! wow, that a very sweet kind of friend of you Tandy…. your labneh looks damn delicious!!! Haven’t made this for ages – thanks for such a great reminder! OMG, is it really that easy to make Tandy?! I need to do this! I could not believe it either Lizzy! I can’t believe I’ve never heard of Labneh before. It seems so simple and looks so delicious. Oooh, lucky girl! I love any kind of recipe magazines and would have a subscription to them all if I could. What a gift! I’ve never tried labneh but now I’m definitely intrigued. Seems so easy to make! Hi Tandy, you make the preparation look so easy, I bet this is delicious! I’ve never heard of labneh, but this looks just lovely! That’s so awesome they gifted you the next 11 issues – now that’s customer service! Btw – I’ve never had Labneh – I am so intrigued! 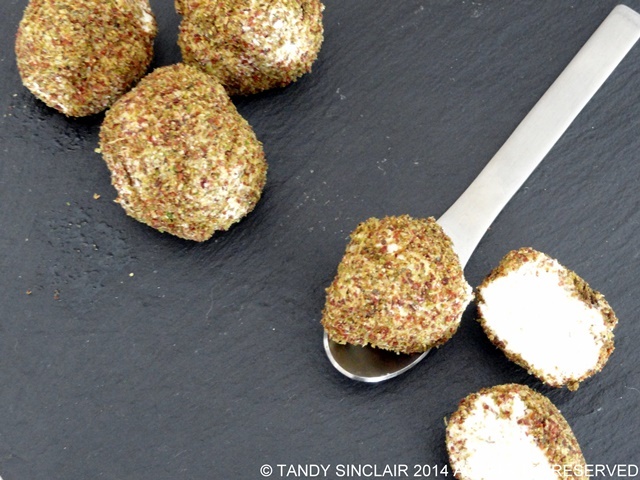 I love labneh AND za’atar…so I definitely need these bites! I have some left over if you want to visit …. I had never heard of labneh but these little balls are so impressive. Ditto the response of Taste to your card dramas – what great customer service.